Smartphones and tablets are the way ahead, we are constantly told. If you are not targeting the mobile shopper, you are missing out, the so-called experts tell us. True, mobile use is increasing significantly. True, people use their mobiles a lot when out shopping. True, people look at things to buy when they are using their smartphones are tablets. Almost everyone who uses mobile devices to look at things for sale fails to buy anything. According to new research from Monetate, less than 1% of people shopping on their smartphone actually go ahead and buy anything. Indeed, the study showed that the number of people buying from a smartphone is almost four times less than the rate of purchase on a desktop computer. Far from us all rushing to our mobiles to buy things online, we are still wedded to our desktops to make a purchase. The results are all-the-more striking because they are based on the analysis of 7bn online shopping sessions. This is not some minor study. 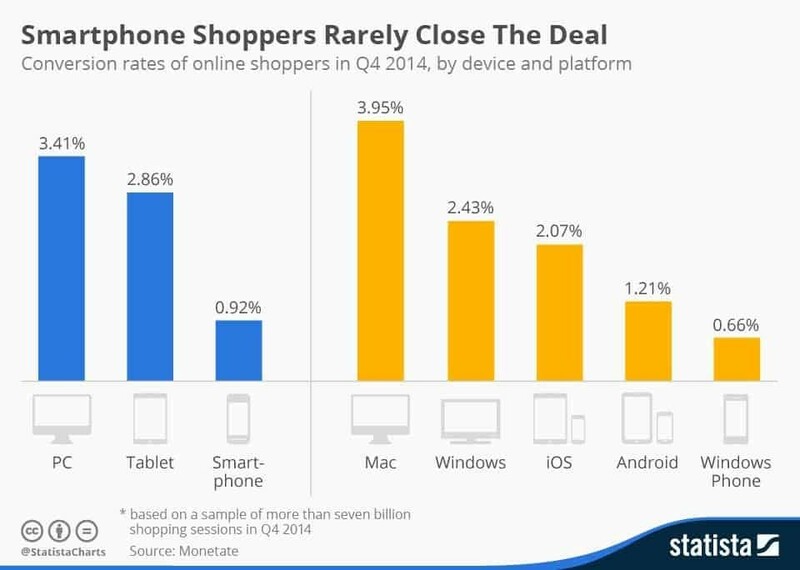 So, if vast numbers of people are using smartphones to visit ecommerce websites, why are they not buying something? The answer is probably trust. People are used to smartphones losing connection, so they are scared their financial data will be interrupted mid-purchase and a second attempt could lead to a double charge on their credit card. They are also worried that confidential data could be stolen whilst using wi-fi in public places. Back in the safety of their own home, people can shop online more securely. So, what can you do about this? After all, as an online retailer you have no control over mobile phone connections or public wi-fi security. The answer is to assume people will NOT buy when they are using a mobile device, but that they will buy later on when they get back to their desktop machine. This means instead of providing “buy now” buttons on mobile sites or pages delivered to mobile devices, you could instead have a “save for later” button which syncs the bookmark of the sales page back to their desktop machine. Or you could have an “email myself” button which creates an email so that people can pick it up later on when they are using a desktop machine. You can come up with a host of ways in which you can make it easy for mobile shoppers to buy later when they are back at home. If you do this, you’ll increase your conversion rate, thereby making more profits. However, if you stick with trying to improve your mobile site to sell more, all you will do is make it even easier for people to decide not to buy. Online advertisers are failing to make the most of mobile Advertisers are spending money for almost no return. Mobile users are abandoning websites having clicked on a pay per click advert.